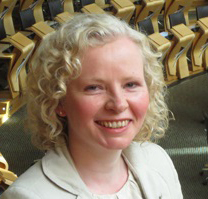 Today’s guest blog comes from Claire Baker MSP, who has lodged proposals to amend the law of culpable homicide ensuring it applies consistently across Scotland for acts of homicide in our communities and our workplaces. It is always painful for a family to lose a loved one. Where the death occurs at work and caused by reckless or negligent actions by employers, the family do not experience the loss any differently if an individual, an association or a corporate organisation causes the death. The family want to see justice and the wrongdoer convicted of an appropriate crime with the appropriate moral and public censure; and, where appropriate, the wrongdoer capable of receiving a custodial sentence. Bereaved families expect the law to treat all types of wrongdoers the same. I believe that is what society also demands. But, as law currently stands, that does not happen in relation to the criminal offence of culpable homicide. Where an individual causes death by recklessness or gross negligence, it is relatively easy for the Crown Office and Procurator Fiscal Service (COPFS) to secure a conviction for culpable homicide. However, where that act of homicide occurs in the workplace, it becomes difficult, if not well-nigh impossible, to secure a conviction of an individual or an organisation for their reckless or negligent actions that led to the death. The law of culpable homicide has always failed to have one clear set of rules that apply to all wrongdoers, individuals and organisations alike. 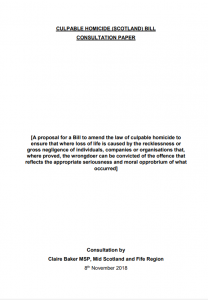 Many hoped that would be achieved by the Corporate Homicide Act but it has failed entirely in that objective. Over the past 10 years in Scotland, not one charge, let alone a conviction, has taken place. My proposed legislation would introduce appropriate legal remedies for loss of life where the recklessness or gross negligence of employers, businesses or corporations is proved. Critically, it would also provide a greater focus on health and safety in organisations and in the workplace, supporting a reduction in fatalities, and changing the culture in Scotland for the better. While currently a company can be pursued through health and safety legislation and fined, it is very difficult to convict them of culpable homicide, even when the Lord Advocate recognises the crime and wants to bring forward criminal charges. This iniquity must be addressed. The actions taken in recent years have done nothing to provide justice for families and little to reduce the numbers of lives lost at work in Scotland. The efforts of campaign group such as Families Against Corporate Killers (FACK), supported by trade unions and Scottish Hazards, have kept the injustice faced by families at the top of the agenda for many years. My proposals are designed to ensure that justice is seen to be done across our society and those who suffer the anguish and heartache of losing a loved one due to work no longer feel justice is denied.